In honor of the Saints' aggressive victory over the Colts, I am posting a recipe for jambalaya, which happens to be what I was eating during the game. This a cajun jambalaya, in contrast with a creole jambalaya (or "red jambalaya"), which includes tomatoes and seafood. This version contains smoked sausage, chicken and, ideally, tasso - a smoked and spiced ham. Creole jambalaya originated as an attempt by Spaniards to make paella in the New World (absent saffron). Gradually, this dish was introduced to the Cajuns in Lousiana's low country who adapted it the ingredients that they had available. Cajun jambalaya (or "brown jambalaya") is traditionally smokier and spicier than creole jambalaya. The beauty of jambalaya is, of course, that it can be made with a wide variety of ingredients- essentially, whatever is lying around and needs to be eaten. 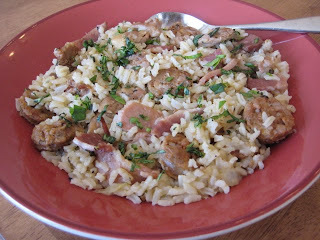 For cajun jambalaya, the smokiness is key so it is important to find some good smoked sausages, like andouille. *This recipe should serve 6-8 people. If you are feeding a large crowd, you can double it, but be sure you have a pot that is big enough. First, Tasso is a heavily smoked ham with a spicy, peppery rind. It is hard to find outside of Louisiana but it will take the dish to whole new level if you can find it. In the past I have ordered over the internet at comeaux.com or had someone visiting New Orleans bring me back some. However, if you can’t get some, don’t panic! Any smoked pork will do, and failing that you could add some other type of ham, which while admittedly not the same thing, will do in a pinch. Second note: Use good quality sausage for this, fresh if possible. The sausages at the Whole Foods deli counter are a good bet. Keep in mind that the sausage ingredients are flavoring the whole dish, so you want them to be strong and good quality. Third note: Use good quality, homemade chicken stock for this dish – it makes a world of difference. If you do not have stock stashed away in the freezer, just be sure you have a chicken carcass (or a bunch of chicken bones) saved, and a simple but strong stock can be made in a few hours with the addition of some carrots, celery, peppercorns and bay leaves. 1) put the sausages in pan with water to cover and bring to a boil. Reduce the heat and let simmer for ten minutes. 2) In the meantime, chop the chicken things into large-ish bite size pieces. If they are boneless, great – if not, you will have to bone them. The easiest way is find the chopped end of the bone, strip the meat down the bone to the joint, then cut out the joint and remove the bone altogether. You will be left with a nice strip of meat. Set aside the chopped chicken. 3) Remove the sausages from the pan and cut into ¼ inch rounds with a serrated knife. They should be cooked enough to hold together, don’t sweat it if they are a little raw in the middle. 4) In a large pot or dutch oven, add a little olive oil and then the sausages. Saute them over medium heat until browned, maybe 10 minutes. Remove with a slotted spoon and set aside. 5) Without cleaning, add the chicken to the pot and sauté over medium heat until starting to brown. Remove and set aside with the sausage. 6) In the same pot, add the chopped onion and garlic and cook until the onion softens, maybe 7 minutes. Then add the tasso or smoked ham, basil, thyme, some salt and pepper and cook for a few more minutes. Don't be shy about stirring up the brown bits stuck to the pot, this is where the "brown" in "brown jambalaya" comes from, like the "fond" in french cooking. If you like it spicy, you could shake some cayenne pepper in it at this point. Remove all ingredients and store them with the sausage and chicken. What you have at this point is the jambalaya “base,” which basically means everything except the stock and the rice. You can make it ahead of time and store it the fridge, even a day in advance if necessary. 7) When you are ready to finish the dish, put the "base" in a large pot and add the stock and the rice. Stir thoroughly to combine, then bring to a boil. As soon as it begins to boil, reduce the heat and simmer, covered, for 25 minutes. 8) After 25 minutes, take the cover off and stir again to evenly distribute the rice and the meat. Season with salt and pepper if necessary, and serve with hot sauce on the side. This sounds and looks amazing. I need to try this!